When Beti asked her twelfth-grade students to consider Guatemala’s contemporary challenges, their suggestions quickly filled the board. In large letters, their words loomed like storm clouds: corruption, violence, extortion, threats, robberies, assaults, exploitation, discrimination. Like many conversations I observed at this self-described liberal school in Guatemala City, talking about present-day challenges (in 2012) could not be disentangled from their historical antecedents. Pivoting between the authoritarian past and the postwar remilitarized present raised questions about whether their country was the democracy it claimed to be. What was the real potential for ordinary citizens to contribute to the peace and inclusion promised in the postwar transition? As class ended, Luisa turned in her seat to face me. She explained, “The problem here is corruption… This is why nothing changes.” Through Luisa’s writing and other interactions with her, I learned that she was the victim of multiple assaults in her neighborhood and had recently lost several friends to violence she attributed to gangs. She did not trust the police. She did not trust her neighbors. She spoke often about feeling closed off and her inability to move freely. In Luisa’s company, I was reminded that my role as ethnographer demanded careful attention to the everyday impacts of violence in a way that highlighted the toll it took on individuals’ well-being as their social and spatial mobility narrowed (Winton 2005). Luisa was tough, but her voice was as small as her body. It took a long time to earn her trust, and what finally seemed to persuade Luisa of my legitimacy was my experience with the gendered risks of navigating the capital and the need to isolate myself as a protective strategy. She reminded me that adapting to violence was embodied and often invisible. I would have to feel some things myself to know them. Xila, in the desk behind me, tapped my shoulder and glared past me, at Luisa. “It’s not all bad. 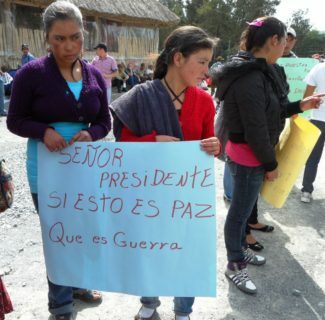 We have nice things in Guatemala too.” Luisa admitted, “There are nice things… But we have real problems.” Xila insisted, “But it’s getting better.” Xila was not ignorant or dismissive of the linkages between criminal and political violence. She often argued that the class textbook did not tell Guatemala’s “real history,” which included urban resistance and student movements that allowed for rights and protections that they took for granted today. In Xila’s company, I was determined to document how young people sought to define themselves beyond the violence they endured. They would soon be high school graduates with aspirations to attend college and creative ambitions despite an awareness of the constraints on their self-expression. As working class youth, most students at this school were sympathetic to popular movements. But, like Xila, many grew frustrated that protests routinely interrupted their schooling, while tactics such as roadblocks reinforced impressions of “delinquent” youth. From across the room, Huesos chimed in, “Guatemala has always been this way… You can’t have hope in a place like this.” Huesos often reminded me that anything could happen, because “Guatemala is Guatemala.” This refrain emphasized both the normalcy of violence as a function of everyday life and an awareness of its exceptionality. 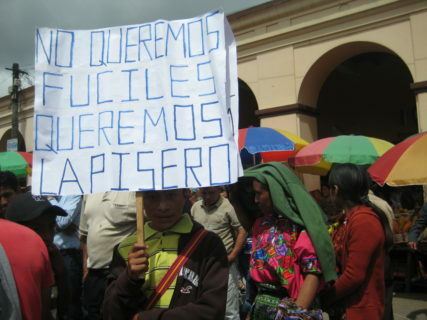 And although this statement fixed Guatemala in a pathologized state, Huesos reminded me that critiques of changelessness might not derive from historical misconceptions, but instead from tracing hidden threads sewn into a longer history of empire, state repression, extreme inequality, racial violence, and civic exclusion. Legacies of the war merged with postwar, “apolitical” violence, manifesting as threats intended to silence survivors, safeguard immunity for perpetrators of war crimes, and renew support for the militarization of society (Levenson 2013; Sanford 2008). Talking with Huesos, I was determined to highlight the ways that survival in a postwar society demanded “an ethos of pessimism” (Lederach 2005, 54). Letting go of hope, as Huesos advised, would defend against disappointment. Young people taught me this lesson over and over again: when one’s hopes were too linked to expectations, hope became a risk. It was not the first—nor the last—time I would be asked to account for my impressions of Guatemala and the ways I would represent them for an imagined international audience. Students talked excitedly about “the book” that would feature their everyday lives while in secondary school, and I tried to convey that they had the agency to determine the story—what did they want readers to learn about them? I do not know that I offered a satisfying answer to Xila’s questions. I recall wrestling with the need to affirm Luisa’s experiences of victimization and the rationality of her learned distrust. Yet, I also had the strong desire to support Xila’s optimism that popular movements had in the past and would, into the future, continue to influence positive reforms. Still, I felt an intense pull to share in Huesos’ indignation at impunity that allowed for the continuity of power. I saw these questions as vital to the long-term relationships I was building with youth, contingent on their impressions of my credibility and commitments to them. My response mattered in other ways, too. Moral outrage is a generative space for forging solidarity in the face of rights violations. My frustration legitimized theirs. Occasionally, my instinct to protect young people from the discourses that denounced Guatemala as “a good place to commit murder” (Alston 2007, 20) were misguided. Some drew power from these policy discourses—feeling visible, affirmed, and in a position to leverage global solidarity to make demands on their state. On the other hand, I did not want to sentence them to a future that was already scripted, ensuring that their participation did not matter. On one of my last days at this school, Xila handed me a handwritten note and instructed me to read it when I was alone. Xila’s main purpose was to remind me that Guatemala was many things to many people. Guarding against depictions of any one thing, she reminded me that some people “spend their lives complaining about the situation but don’t do anything to change it.” Xila felt strongly that young people needed to stay and give themselves over to Guatemala rather than run from it. The everyday dangers and frustrations were part of the story, but so too were the ways they came together to find Mariana when she went missing, and the ways they embraced Javier when a flash mob tried to steal his watch. There were little things they did to fill their lives with joy like using too much eyeliner, inhaling the smell of warm bread at the bakery, and sneaking to the school roof to hold hands with their boyfriends. Though she did not say so directly, Xila’s letter suggested that my hope was intertwined with—and at times, necessary for—hers. In describing each of the four classrooms and communities depicted in the book, I tried not to overstate the agency of Guatemalan youth who endure instability and violence in everyday interactions, and struggle with structural inequality, as well as who experience a narrowing of opportunities to participate as civil society actors. But grounding the study in an understanding of youth experiences also demanded attention to the ways that even the most marginalized assert themselves. Many young people I spoke with across urban and rural settings voiced an acute sense of powerlessness, demonstrating that strategic pessimism and withdrawal from public spaces was a survival strategy in a high-risk environment. Raising expectations and trusting too easily meant letting your guard down. Hope was not easy to hold onto, its edges sharp. Occasionally, however, I saw hope in claims of impotence and indifference, even when these markers of optimism were not visible to young people themselves. The book ends by recognizing that doubt functions paradoxically as fatalism and hopeful anticipation. The refusal to praise small victories is one way of saying, We expect more. We are worth more. This is not enough. Michelle J. Bellino is assistant professor at the University of Michigan School of Education. Her research centers on civic development in conflict-affected contexts, examining youth understandings of historical injustice, agency, and belonging. Her book, Youth in Postwar Guatemala: Education and Civic Identity in Transition, was awarded the 2018 CAE’s Outstanding Book Award. Please send your comments and ideas for Anthropology News columns to CAE contributing editors Patricia D. López([email protected]) and Cathy Amanti ([email protected]).